In early November, 500 stakeholders met in Abu Dhabi for 2017’s largest experts’ meeting on integrated SHC solutions for buildings, industry, cities, regions and utilities. 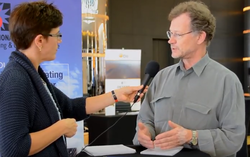 During the conference, we recorded 12 video interviews which outline trends in today’s global solar heating and cooling sector and highlight policy fields where urgent action is required. Have a look at the playlist or read the conference report.